Cake Submitted by Tammy P. from Martelle, Iowa. My cake is a very easy cake that anyone can make and use their own imagination to decorate. (It was made from simple chocolate cake recipe.) 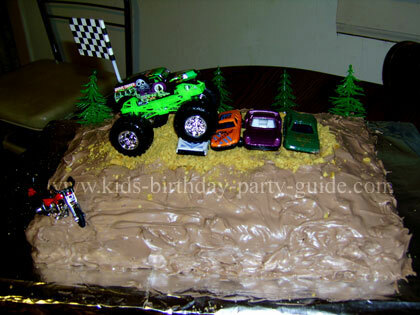 I liked the turn out as well as the birthday boy who asked for a Monster Truck birthday cake. It was fast, easy and my 7 year old grandson was so thrilled, he asked me to print out pictures just to show everyone! In a large mixing bowl, sift together the flour, sugar, soda, baking powder, salt, and cocoa. Add shortening, eggs, vanilla, milk, and water. Beat on low speed for 3 minutes. Pour batter into prepared pans. Bake in preheated 350°F oven for 30 to 35 minutes, or until a wooden pick or cake tester inserted in center comes out clean. Let cool on a rack for 15 minutes. Remove and place layers directly on racks to cool completely. The frosting was a mixture of chocolate and white cans of frosting blended together to get a brown dirt look. The dirt under the cars is just crushed graham crackers. The trees, flag, cars, monster truck and motorcycle where all purchased at stores to add to the scene. Have a look at Monster Truck party area for theme-related planning tips.